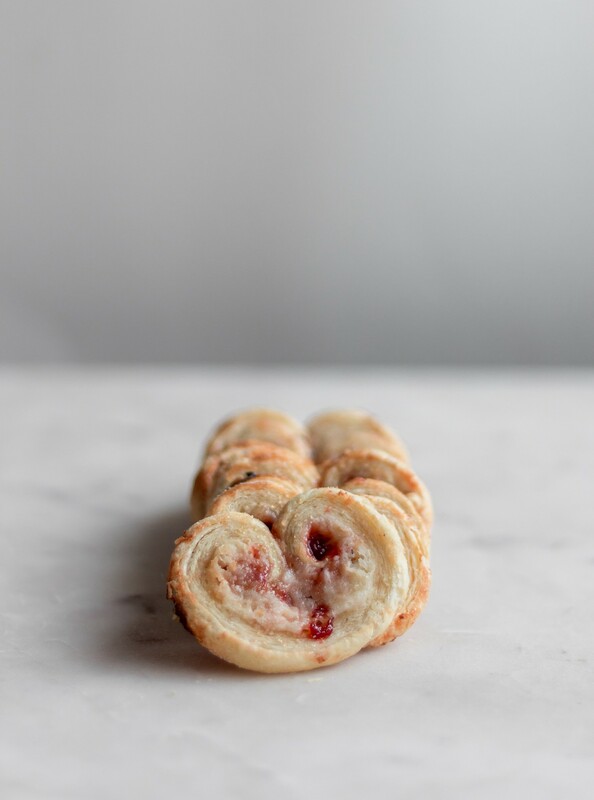 Strawberry Palmiers filled with sweetened cream cheese and flavored with citrus zest and vanilla. I have found my purest form of happiness, and it unashamedly involves gorging myself silly on French pastries at Reno’s newest bakery followed with window shopping and a hot coffee. There’s genuinely nothing better than a solid butter-caffeine fix. The catch is that the bakery sells out quick. This involves me waking up earlier than I would care to on the weekends so I don’t miss out on the Kouign-Amanns. On the other hand, waking up early on the weekends is actually kind of amazing. Everyone is still sleeping in, and it’s so quiet and peaceful. But, this weekend was an exception, because it snowed like crazy. On Saturday night, Marc and I went to a Tom Segura show with some friends. I drank vodka, gambled for the second time ever, and won $9! Because it was blizzarding, it took a century to get a Lyft. Needless to say, we got to bed late and slept in all morning. Then, we put on our snow boots, trudged through the sludge, and showed up at the bakery well past noon. In a surprising twist of events, there were so many pastries left!!! I ate an almond croissant and we shared the perfect sandwich A.K.A. a baguette stuffed with butter and ham. I firmly hold the stance that calories don’t count on weekends in case you were wondering. 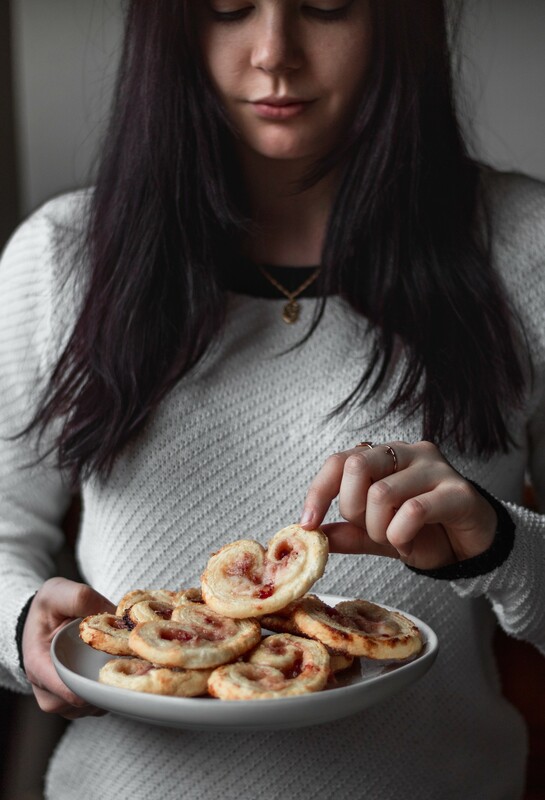 And speaking of French pastries, I have the easiest French pastry recipe to share with you!! Strawberry palmiers with cream cheese, which are like a flaky strawberry cheesecake. 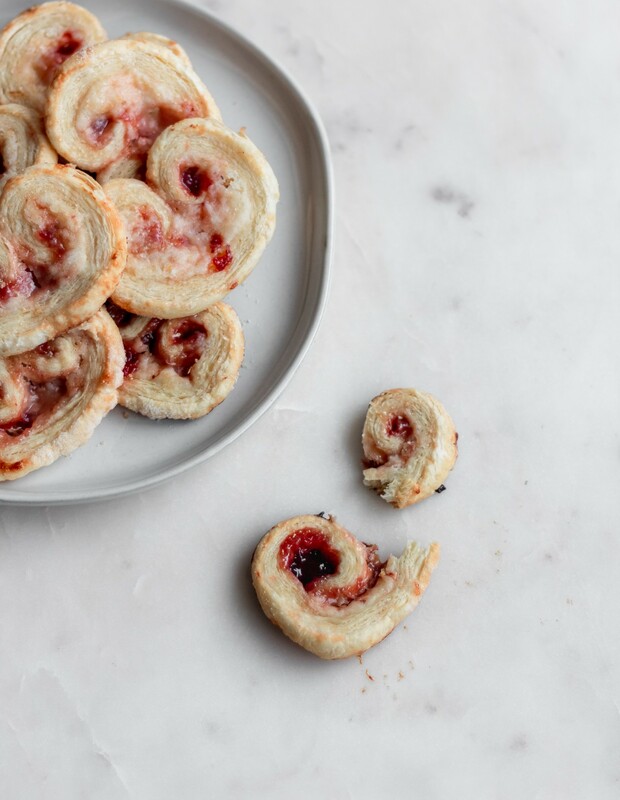 If you can unroll a package of puff pastry, then you can make these strawberry palmiers. I honestly can’t believe how good these are for something that only takes five minutes to put together. Also, they are so similar to a danish that they make eating cookies for breakfast socially acceptable!! 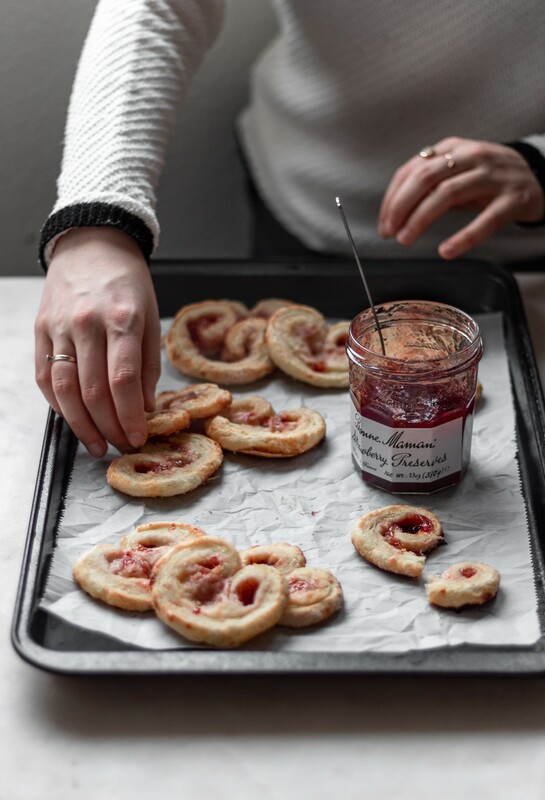 If we’re being totally honest, I actually didn’t plan on sharing these little strawberry palmiers as part of my Valentine’s series. But I couldn’t get the idea out of my head, so here we are! 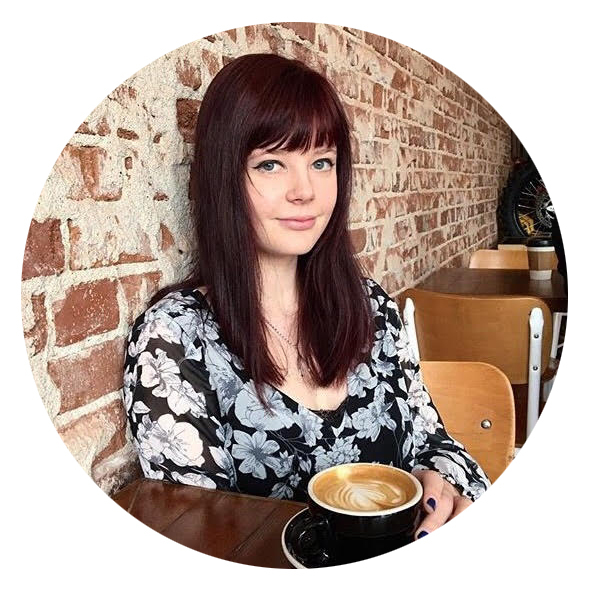 I guess we can say that they’re my love letter to my beautiful readers, because your comments, shares, and reviews make me so happy every day! Soooo thanks for supporting me all these years, and happy Valentine’s Day!! (P.S. If you want to see a video on how to roll palmiers, here’s a good one! Skip to 1:00 to see the rolling action). 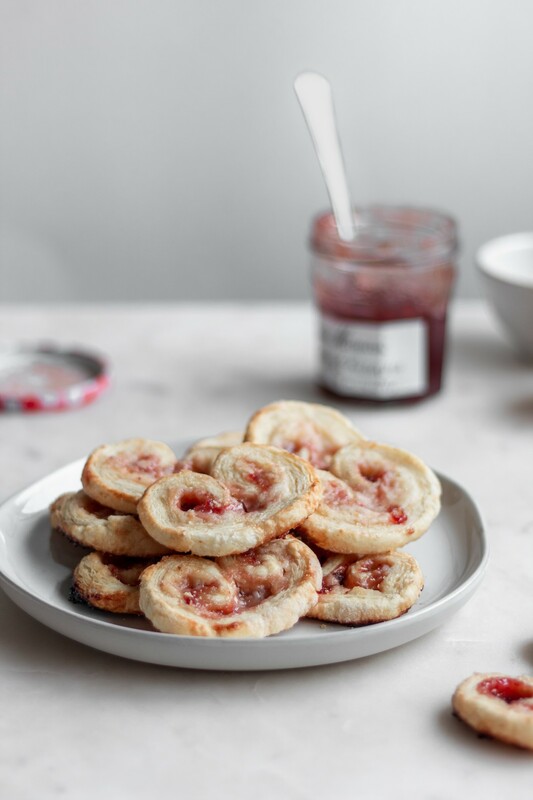 These cookies are so easy to customize with different jams and spices. 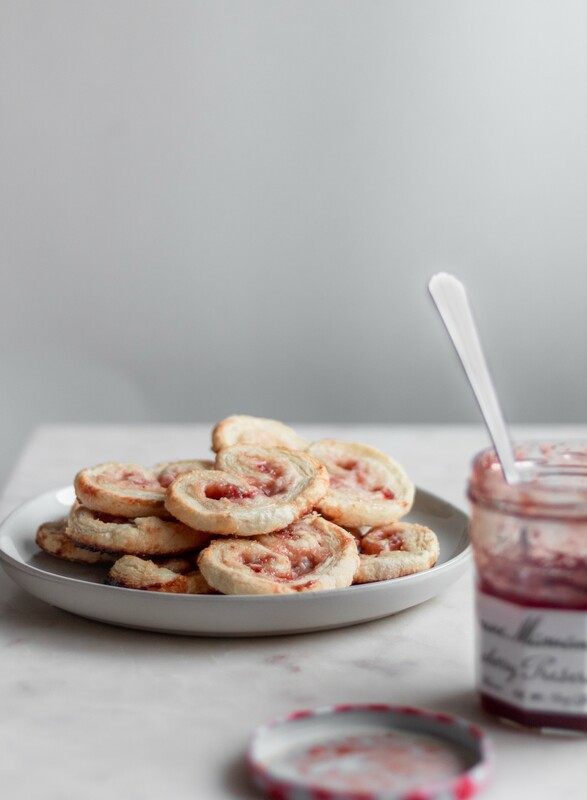 I especially like the idea of lingonberry jam + cardamom or blueberry + ginger! P.S. It is important to let the cookies sit in the fridge or freezer for up to 30 minutes before slicing them, or they will be a huge mess. I'm speaking from experience here! Preheat oven to 425* F. Line two cookie sheets with parchment paper. In a small bowl, mix together the cream cheese, 1/4 cup of sugar, vanilla extract, lemon zest, and a pinch of salt. Set aside. Sprinkle about 1-2 Tbs. of granulated sugar evenly on a clean work surface. Unroll one of your sheets of puff pastry (there is usually two in a 1 lb. box). Roll it gently to seal the seams together and press some of the sugar into the dough. 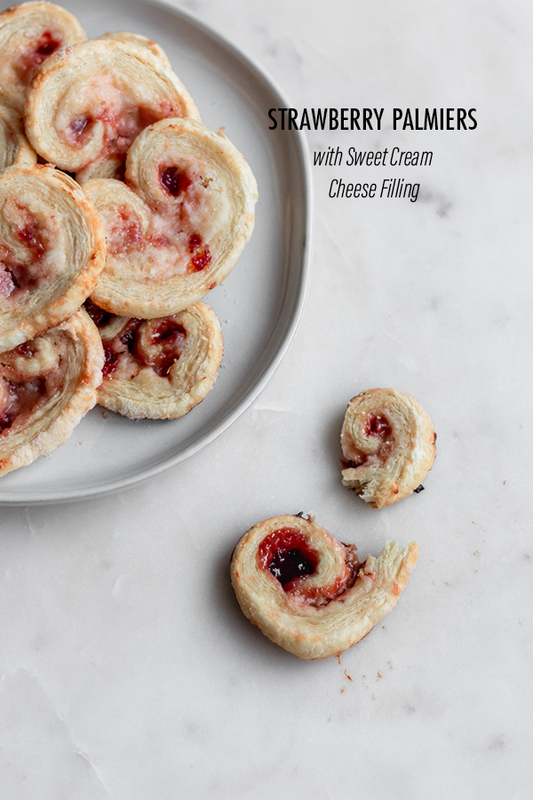 Spread half of the cream cheese mixture evenly on the puff pastry. (It is important to have very softened cream cheese, or it will tear the puff pastry). Spread 2 Tbs. 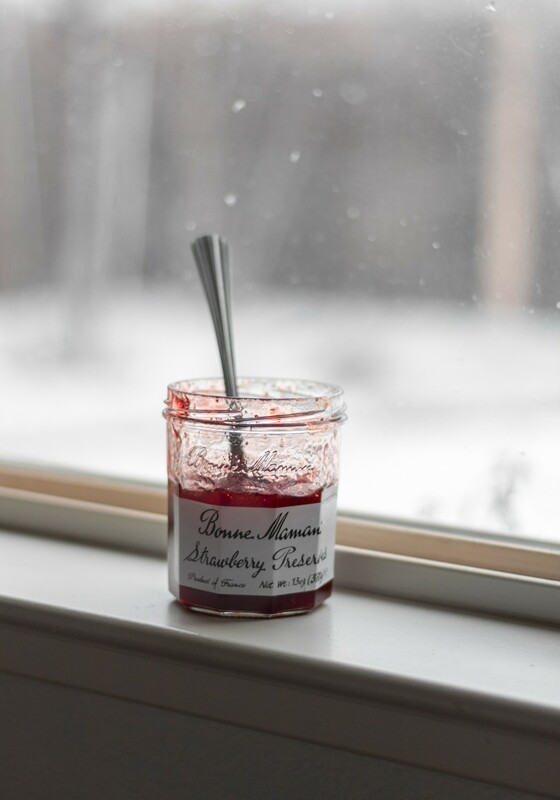 of strawberry jam over the cream cheese layer, adding up to 1/4 c. total depending on how much filling you want. Starting at one end, roll the short edge of the puff pastry toward the middle a total of three times. Keep the roll tight, but do not press it too hard. Repeat on the other side, meeting the two rolls in the middle. Press them together gently. (Alternatively, you can fold the puff pastry rather than roll it. You will have a total of six folds/rolls). Repeat this whole process with the other sheet of puff pastry. Refrigerate the cookie rolls for 30 minutes, or freeze for 15. Once the puff pastry is cold, cut the cookies into 1/4 inch slices. You will have about 16 cookies per sheet of puff pastry. Space them on the prepared cookie sheets 1-inch apart, because they will puff up significantly. Sprinkle with demerara sugar, if desired. Refrigerate any remaining cookies until you are ready to bake them. Bake the cookies for about 8 minutes, or until the tops start to brown. Flip the cookies over, and bake for another 5-7 minutes, or until the cookies are golden brown and caramelized. Cool completely on a cooling rack before serving. Store in an airtight container for up to three days.